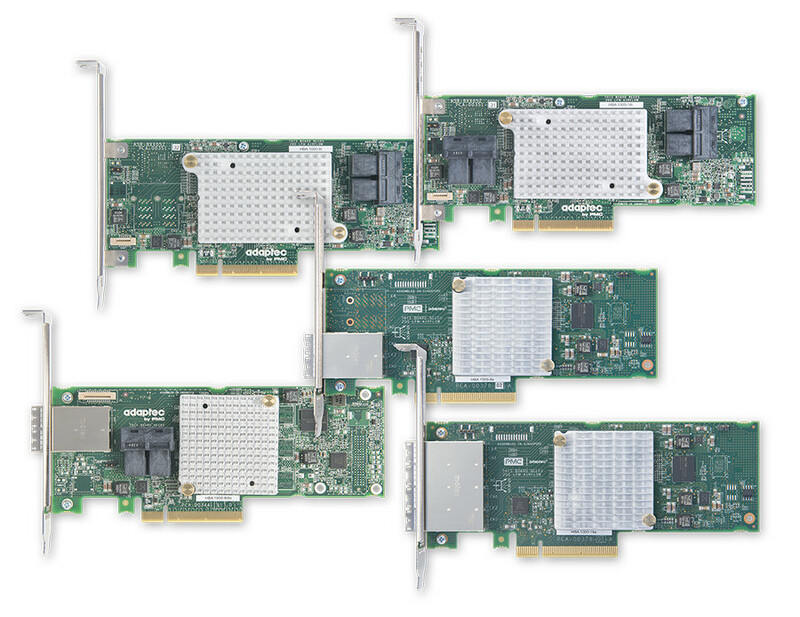 SUNNYVALE, Calif., December 8, 2015 - PMC-Sierra, Inc. (PMC®) (Nasdaq:PMCS), the semiconductor and software solutions innovator transforming networks that connect, move and store big data, today announced the HBA 1000 series of 12Gb/s SAS/SATA Host Bus Adapters, the first products in PMC's new Smart family of solutions for high-performance cloud and enterprise server storage connectivity. The HBA 1000 delivers maximum resiliency and the industry's lowest power using field-proven Smart intellectual property (IP) from the most widely deployed server storage stack and PMC's SmartIOC™ controller. Broad compatibility from PMC Adaptec® management tools and drivers enables easy deployment across a wide variety of data center applications. With up to 16 internal or external SAS/SATA ports in a low-profile MD2 form factor, the HBA 1000 provides a native server connectivity solution that can handle the most demanding workloads and configurations (see video, infographic, power calculator). "PMC's new Smart Storage Solutions combine over 25 years of Adaptec compatibility with our high performance and resilient Smart IP that's based on the industry's most broadly deployed server stack, running on high-density PMC silicon," said Pete Hazen, vice president of the Scalable Solutions Group at PMC. "The HBA 1000 products are the first offering in our Smart family, enabling storage connectivity at less than half the power of alternatives." A low-profile form factor and mini-SAS HD connectors allow the HBA 1000 to install into 2U servers for maximum native connectivity in the smallest footprint with no impediment to air flow. It is fully compatible with RAID adapters and expanders for complete scalability to store, retrieve, and manage data across SSDs, HDDs and tape drives. The HBA 1000 saturates the PCIe® Gen 3 bus and delivers up to 1.3 million I/Os Per Second (IOPS) with SAS SSDs, utilizing 60 percent less power than competing HBAs. This lowers energy consumption and helps avoid the heat dissipation issues that are typically found in dense server environments. The HBA 1000 also delivers 2.5 times greater sequential throughput and 85 percent higher random read performance for cloud data centers deploying SATA drives for application acceleration, compared to a common configuration of up to 10 SATA SSDs attached directly to the server without an HBA. "In the era of high density, virtualized, and scalable Software Defined Storage environments, our customers demand suitable storage solutions that fit their needs," said Andy Lee, director of product marketing at EchoStreams, a cloud solutions provider. "PMC Adaptec storage solutions have delivered power-efficient performance and scalable connectivity enabling us to provide products to meet our customers' demands." The HBA 1000 was designed to scale, connecting up to 16 storage devices natively, or scaling even further with an expander. It enables simple implementation and management to increase resource utilization and lower total cost of ownership. "Hyperscale cloud deployments require an optimum balance of high performance and power efficiency," said Mr. Ding Yu, director of product management at Inspur, the largest domestic server provider in China. "PMC's HBA 1000 is providing Inspur quick time to market with leadership server storage solutions that deliver to these demanding hyperscale requirements." The HBA 1000 has broad operating system and leading Software Defined Storage (SDS) stack support, ecosystem compatibility and a unified set of tools and drivers with forward and backward compatibility with other PMC Adaptec solutions. Management and compatibility are further enhanced by supporting both 6Gb/s and 12Gb/s storage components. "Canonical's Cloud Alliances team has been working closely with PMC to ensure leading Ubuntu support for the HBA 1000," said John Zannos, VP Alliances at Canonical. "With the industry's highest port count, lowest power and leading performance, PMC's new HBA is an ideal pairing with Ubuntu and OpenStack Software Defined Storage workloads." "Ingram has been distributing PMC Adaptec solutions for many years, and I am impressed with PMC's commitment to deliver efficient and scalable storage solutions," said Tom Kagele, senior sales manager, Ingram Micro. "The HBA 1000 is another example of this commitment, and we are excited to provide this compelling storage solution to our extensive customer base." 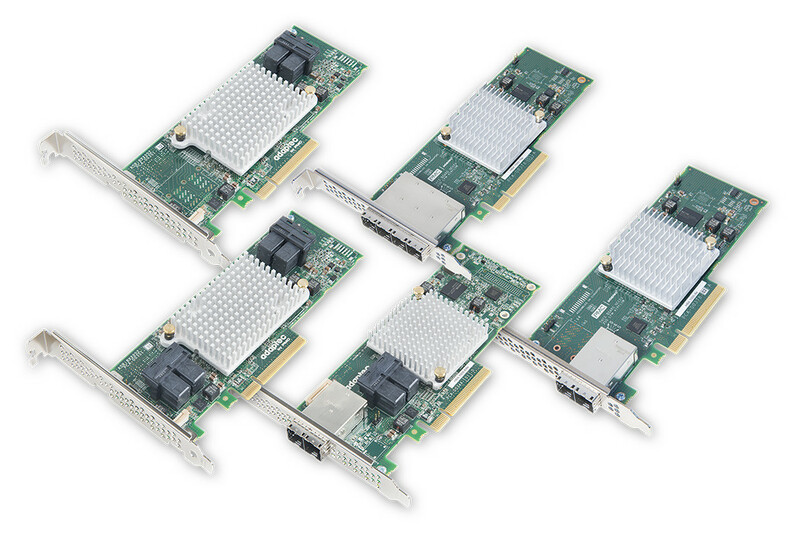 The HBA 1000 offers the highest port count in a low-profile, MD2 form factor HBA. It is available in five different models, with up to 16 internal or external SAS/SATA ports and supports PCI Express® 3.0. The PMC Adaptec HBA 1000 series is available now through PMC's worldwide distributors and storage channel partners. For more information, visit: www.adaptec.com. PMC is a leading provider of enterprise and data center solutions for networked and server storage applications with a broad portfolio of AdaptecRAID adapters and HBAs, Flashtec™ NVMe controllers and NVRAM drives, Switchtec™ PCIe switches, Tachyon® SAS/SATA and Fibre Channel protocol controllers, RAID controllers, SAS/SATA I/O controllers and SAS expander products. Together, these products provide end-to-end semiconductor and software solutions to the industry's leading storage OEMs, ODMs and hyperscale data centers. For more information, visit http://www.pmcs.com/storage. PMC (Nasdaq:PMCS) is the semiconductor and software solutions innovator transforming networks that connect, move and store big data. Building on a track record of technology leadership, the company is driving innovation across storage, optical and mobile networks. PMC's highly integrated solutions increase performance and enable next-generation services to accelerate the network transformation. For more information, visit www.pmcs.com. Follow PMC on our Blog, Facebook, Twitter, LinkedIn and RSS. © Copyright PMC-Sierra, Inc. 2015. All rights reserved. PMC, PMC-SIERRA, TACHYON and ADAPTEC are registered trademarks of PMC-Sierra, Inc. in the United States and other countries, PMCS, Flashtec, SmartIOC and Switchtec are trademarks of PMC-Sierra, Inc. PMC disclaims any ownership rights in other product and company names mentioned herein. PMC is the corporate brand of PMC-Sierra, Inc. This page contains a single entry by Editor published on December 8, 2015 4:31 PM. Toshiba Announces Next Generation Enterprise Performance HDD was the previous entry in this blog. SCSI Trade Association Unveils Updated Technology Roadmaps Highlighting Continued Innovations in SAS Data Storage Interface is the next entry in this blog.